North Korea has declared it is in a 'state of war' with South Korea. From the moment of declaration, it says, it will deal with its southern neighbor according to "wartime regulations." Pyongyang also warned it would retaliate against any provocations by the US and South Korea without "any prior notice." Russia has called for restraint from all sides involved. 16:21 GMT: A top North Korean decision-making body has issued a statement saying that NK’s nuclear weapons are a "treasure" that will not to be traded for "billions of dollars." 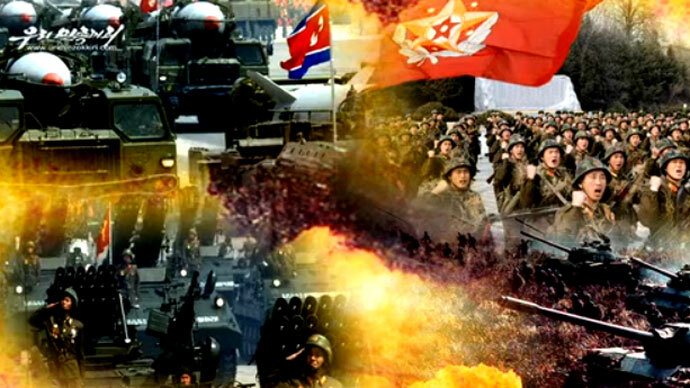 The statement, delivered through the official Korean Central News Agency (KCNA), read that the country’s "nuclear armed forces represent the nation's life, which can never be abandoned as long as the imperialists and nuclear threats exist on earth." 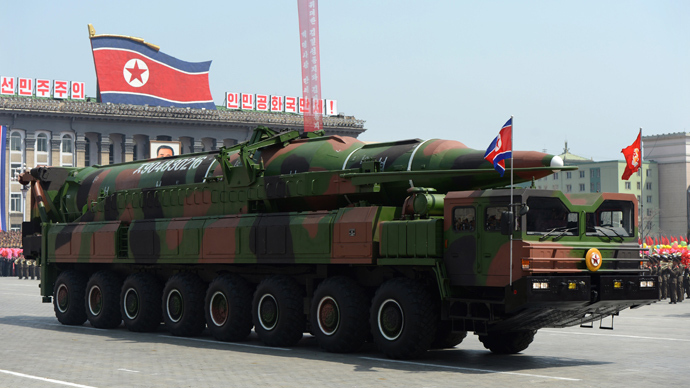 North Korea’s nuclear weapons are “neither a political bargaining chip nor a thing for economic dealings to be presented to the place of dialogue or be put on the table of negotiations aimed at forcing (Pyongyang) to disarm itself," the statement read. Speaking at the plenary meeting of the central committee of the ruling Workers' Party, North Korean leader Kim Jong-un warned that his country will continue launching rockets. 16:12 GMT: Venezuela’s Interim President Nicolas Maduro has called for peace and reconciliation on the Korean Peninsula. “We hope for Peace in the World. The threat on the Korean peninsula must be resolved with wisdom and diplomacy,” Cuba’s Latin American News Agency cites him as saying. 14:50 GMT: The UK Foreign Office has called on North Korea to cease its bellicose rhetoric following Pyongyang’s latest pronouncement. "We have made clear to North Korea that its long-term interests will only be served by constructive engagement with the international community. These threatening statements will only seek to isolate it further. The armistice agreement has enabled the Korean peninsula to benefit from 60 years' peace. Maintaining it is in the best interests of all," the government said in a statement. 14:20 GMT: In the North Korean capital of Pyongyang, life is continuing as usual despite the recently declared ‘state of war,’ Itar-Tass news agency reports. There has been no observable mobilization of military forces in the city, nor have there been any changes in the troops deployed around foreign embassies. Shops and restaurants have remained open, and there have been no interruptions the city’s public transportation system. 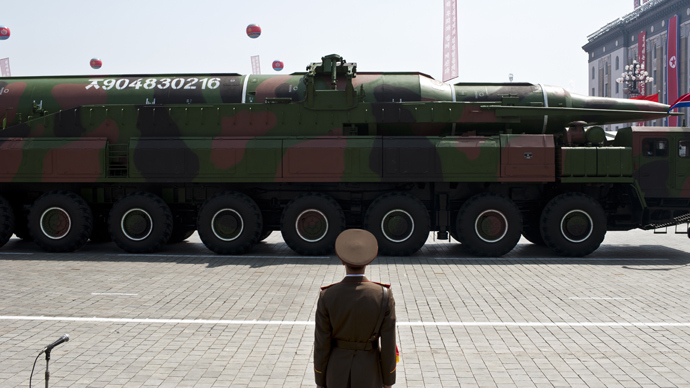 12:49 GMT: France calls on North Korea to refrain from more provocations against its neighbor. "We are very worried about the state of things on the Korean Peninsula," a foreign ministry spokesperson said. "We urge North Korea to withhold from further provocations, follow its international obligations including those with the UN, and start negotiations as soon as possible." 12:14 GMT: "I think there is always room for miscalculation and things spiraling out of control," Sung-Youn Lee, professor at the Fletcher School of Law and Diplomacy at Tufts University told NBC News. "But he [Kim Jong-un] is following the playbook set by his father and grandfather." 11:11 GMT: North Korea’s rhetoric has had little impact on South Korean stocks – the main KOSPI (Korea Composite Stock Price Index) gained 2.9 percent this week, its best performance in six months, Bloomberg reports. 10:58 GMT: North Korea has threatened to shut down the Kaesong joint factory complex. A spokesperson for the Northern office that controls the industrial complex said the factory park on the shared border would be closed if South Korea continues to insult its neighbor's dignity. Pyongyang expressed anger over media reports that said the factory had remained open, as the facility is a source of wealth for the North. So far, business has been operating normally at Kaesong despite the rising animosity between the Koreas. #NorthKorea says will suspend #SouthKorean travel to Gaeseong, close the complex if #US, #SouthKorea continue "insulting its dignity." 10:12 GMT: Moscow believes that Seoul and Washington have both taken a measured response in light of the new threats from North Korea. "The situation is tense and dangerous, but there are some hopeful moments, the US and South Korea have reacted calmly and it means events have not yet spun out of control," a source in the Russian Foreign Ministry told Interfax. "It is time for quiet diplomacy to find political solutions out of the crisis." 9:55 GMT: Speaking at a workshop for senior officials from the government, the presidential office and the ruling Saenuri Party, Defense Minister Kim Kwan-jin said he does not rule out the possibility of "armed provocation" from the North. "If provoked, we will mobilize not only all of our military strength but also that of the US mainland and suppress [the North] in a single stroke," the minister was quoted as saying by participants of the workshop. "Our military is maintaining full preparedness to leave no blind point in safeguarding the lives and safety of the people," the South Korean defense ministry said in a statement. Despite the harsh threats, the North's army has made no unusual moves, a military source said. 9:48 GMT: North Korea said it would shut down its joint industrial zone with the South if Seoul continues to insult its integrity, North Korean news agency KCNA reported. 9:18 GMT: German Foreign Minister Guido Westerwelle has warned against the escalation around the Korean Peninsula in an interview with Bild.de newspaper. North Korea should stop playing with fire and curb its nuclear program, he said, adding that the situation in the region directly affects global security and peace. KCNA: "Nuclear war on the Korean Peninsula has become unavoidable." 8:46 GMT: The Russian Foreign Ministry calls on all sides involved to act responsibly and be reserved after the latest round of threats from the North Korean leadership. "We hope neither side crosses the line that will become a point of no return," a Russian Foreign Ministry spokesperson told Interfax. 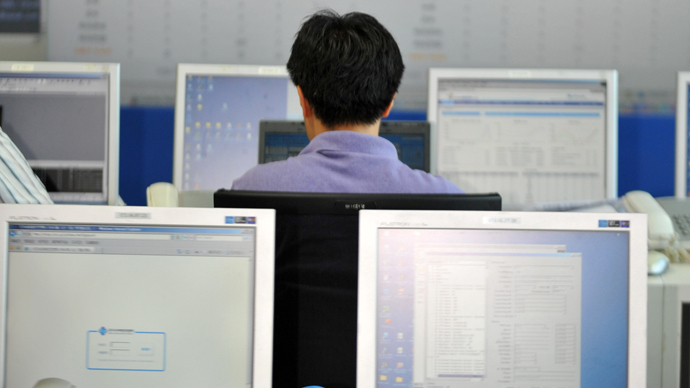 8:22 GMT: 33-year-old tutor Kang Tae-hwan told AP that South Koreans didn't seem "to be that nervous" because they had "previously experienced such rhetoric and threats from the North many times in the past." 7:57 GMT: The White House has dismissed allegations the US has escalated tensions in Korea by its deployment of B-2 stealth bombers. "It's clear that the escalation is taking place from the North Koreans, based on their rhetoric and on their actions," White House spokesperson Josh Earnest told reporters. #OpNorthKorea- It is still attacking, however korea-dpr.com is still up. All others are #TangoDown"
6:41 GMT: Rallies and meetings under the slogans "Death to American Imperialists" and "It's time to Move from Words to Deeds" are being held across North Korea in support of Kim Jong-un's declaration of war on the South. 6:28 GMT: "As the US forces support the South with their weapon detecting capability or B-2 stealth bomber, I do not think war will break out," 81-year-old Seoul pensioner Han Kyung-soo told AP. 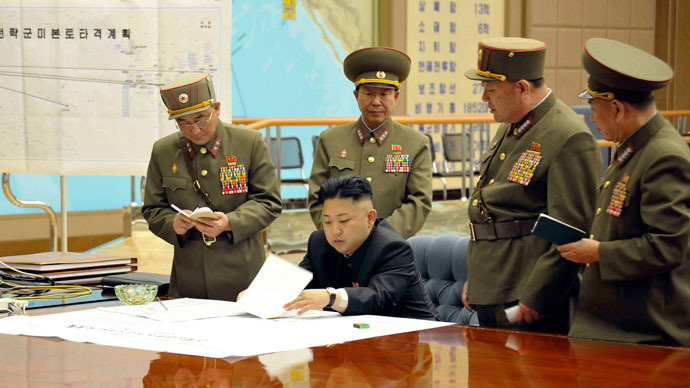 "If it breaks out, it means that the North Korean regime will fall." 6:08 GMT: Despite the threats, border crossings by South Koreans to and from the joint industrial complex in the North Korean border city of Kaesong are proceeding normally. The complex, where 123 South Korean companies run factories with cheap North Korean labor, is a major source of hard currency for the communist nation. SMS from #ROK Unification Ministry: 157 S. Koreans entered & 427 exited Kaesong Industrial Complex (#DPRK) today. 308 staying inside. 6:03 GMT: Australia condemns the threats by North Korea on the South and says they are considering imposing more autonomous sanctions on the nation. 5:49 GMT: "We have no indications at this point that it's anything more than warmongering rhetoric," CNN reports Pentagon reaction. 5:02 GMT: "We will first target and dissolve mainland United States, Hawaii and Guam, and United States military based in South Korea. And the (South Korean presidential office) will be burned to the ground," the KCNA report said. South Korea's Unification Ministry released a statement saying the latest threat was not new, and was just a follow-up on Kim's earlier order to put troops on high alert in response to the annual US-South Korean military drills. 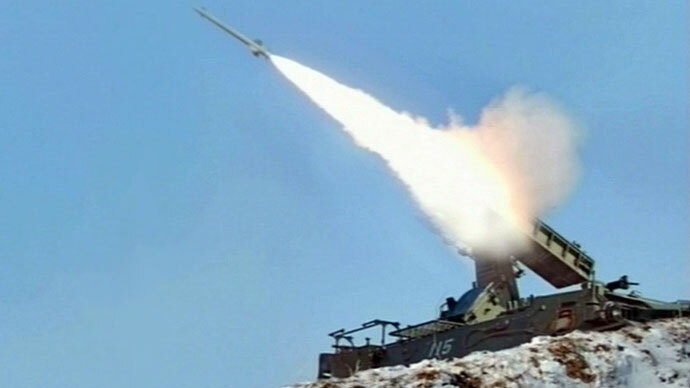 Pyongyang sees those drills as rehearsals for an invasion; the US and Seoul call them routine and defensive. The warning came a day after North Korean leader Kim Jong-un put strategic rocket units on standby, threatening to strike targets in South Korea and the US, over the American deployment of two B-2 bombers in a training mission in South Korea.